This policy has met some resistance from the public, epitomized by the U.K. journalist Ambrose Evans-Pritchard who called this a “calamitous misadventure”. (1) Bank lending rates for companies have fallen since the advent of negative rates. If negative rates aren’t making credit cheaper, then they won’t be doing much to stimulate the economy. 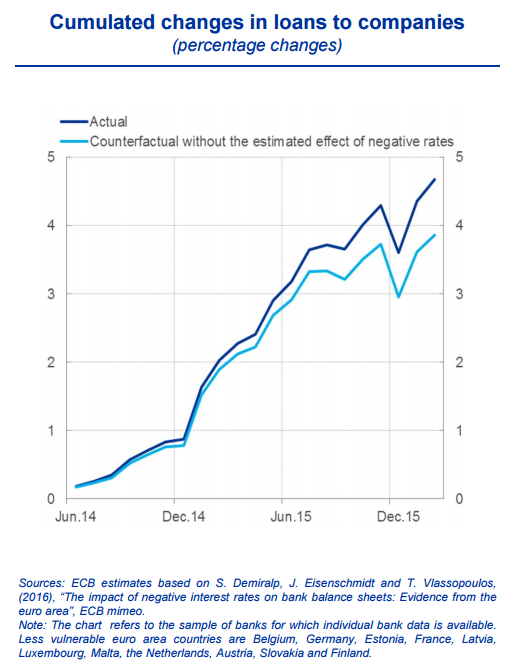 The ECB economists argue that negative rates are lowering business borrowing costs. Across the euro area, loans from banks to corporations have become less expensive since negative rates were adopted. 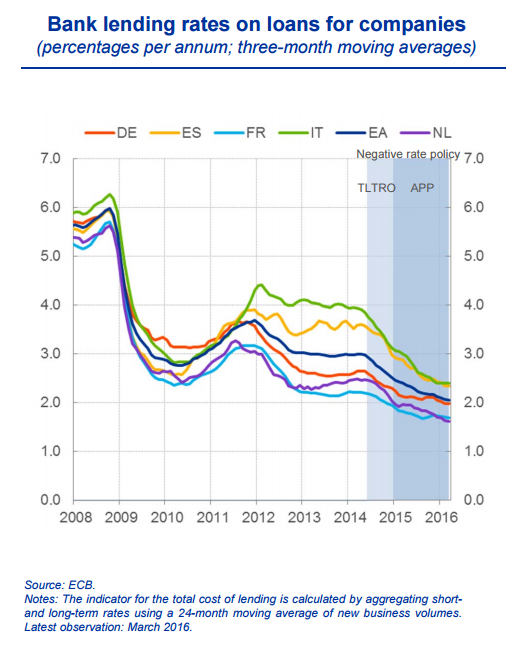 Of course, it’s hard to pinpoint how much of the decline was due to negative rates, and how much was caused by other developments in the economy or by programs the ECB has been running, like its targeted longer-term refinancing operations (TLTROs) and asset purchase programmes (APP). (2) Negative rates have made banks more likely to turn extra reserves deposited at the central bank into lending or purchases of bonds. To assess how likely banks are to convert excess liquidity (i.e. the excess reserves that are subject to the negative rate charge) in one month into loans the next, the ECB economists use a monthly, bank-level panel dataset covering the August 2007 to May 2015 period. They regress loans to non-financial corporations and households (as a share of main assets) in month t+1 on both excess liquidity in month t and excess liquidity in month t multiplied by a “post-negative rates” dummy variable. (They also include several controls, such as loans to non-financial corporations and households in month t, and time and bank fixed effects.) Their goal is to see whether the coefficient on excess liquidity increased during the negative-rate period, which would suggest that negative rates were making banks more inclined to turn excess liquidity into loans. According to their analysis, a one-percentage-point increase in a bank’s excess liquidity liquid assets (as a share of main assets) led to a 0.01 percentage-point increase the next month in loans to households and non-financial corporations (as a share of main assets), for banks in core euro area countries. This is an economically material increase as it corresponds to about 20% of the average monthly lending to households and non-financial corporations by banks in these countries. Moreover, it is significantly higher than the reaction to excess liquidity seen in the “pre-negative rates” period. Similarly, extra liquidity one month led to a slight pickup in government bond-buying the next. This suggests that there is something unusual about crossing the zero lower bound—going negative isn’t like a traditional decrease in interest rates. (3) Total credit extended to companies has gone up relative to what the above estimates imply would have happened without negative rates. 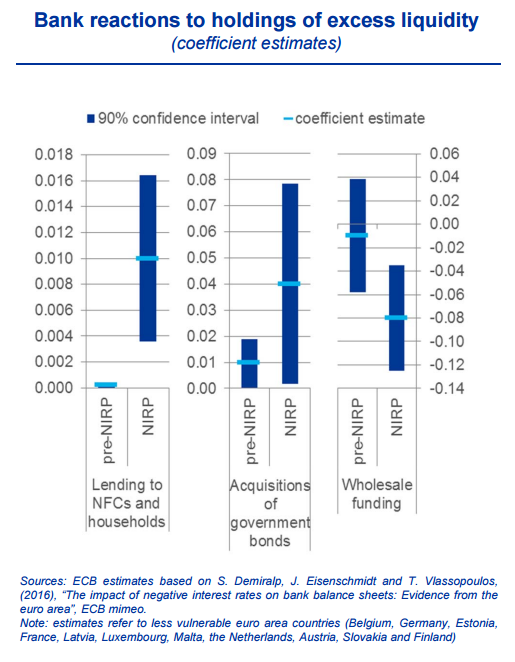 To gauge the effect of the estimates above on lending, the ECB economists cut the data another way. 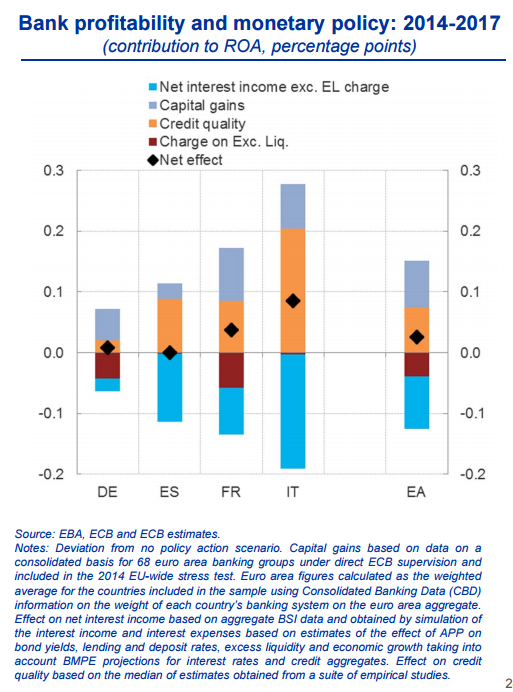 They find that if negative rates have been encouraging banks to turn excess liquidity into loans at the rates the regression estimates, then the policy has been associated with a nearly one-percentage point increase in total lending in core euro area countries since June 2014. The authors argue that, contrary to the predictions of many pundits, banks’ bottom lines have not been hurt by negative rates even though they have reduced banks’ net interest margins (the interest earned on assets minus interest paid on deposits). They contend that for the time being this blow to bank profits is outweighed by the improved creditworthiness of their borrowers and the increased value of their assets (bonds, equity, etc.) that negative rates—together with the rest of the ECB’s monetary policy measures—have helped produce. The chart below shows their estimates, based on historical data from 2014 to the present and simulations for the rest of 2016 and 2017. 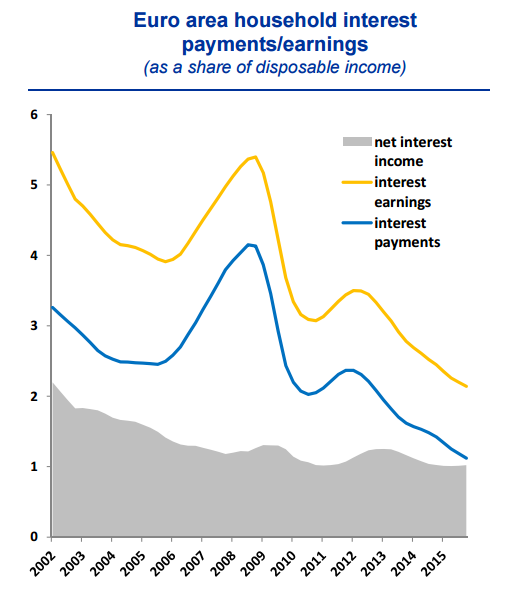 (5) Under negative rates, the average household’s net interest income has been largely unaffected. While negative rates have pushed down returns to household saving, they’ve also pushed down the costs to household borrowing for mortgages, student loans, and the like, the authors note. For the overall euro area economy, the two broadly offset each other although, of course, families who save a lot in bank deposits have been hurt and those who primarily borrow have benefited. Some critics of negative rates and other recent ECB measures argue they’ve increased the chances of a financial crisis. The authors try to assess whether that’s true by asking what negative rates will, by 2018, have done to economy-wide private leverage (the ratio of debt to nominal output for households and companies). Their model-based estimates suggest negative rates will have decreased leverage by increasing inflation and growth enough to compensate for the increased costs of financing the additional credit negative rates caused. (7) Negative rates aren’t the problem—they’re a symptom. The central banks of Sweden, Denmark, Switzerland, Europe, and Japan aren’t the primary cause of low interest rates, which have been declining for decades, as have estimates of the neutral or natural real interest rate (the one that is projected to prevail when an economy is at full employment and price stability). As the neutral rate has fallen, central banks trying to provide accommodation have lowered their policy rates. They see negative rates as a symptom of deeper global factors, such as an excess of global savings at a time of lackluster demand for investment. But—the authors add—that’s not to say central bankers think low rates are harmless and won’t cause asset bubbles or pose other threats. When central banks go negative to stimulate the economy, they’re predicting that low rates in the short term will improve the economy enough to lead rates meaningfully away from zero in the medium term. In this way, negative rates are a tool designed to end themselves. 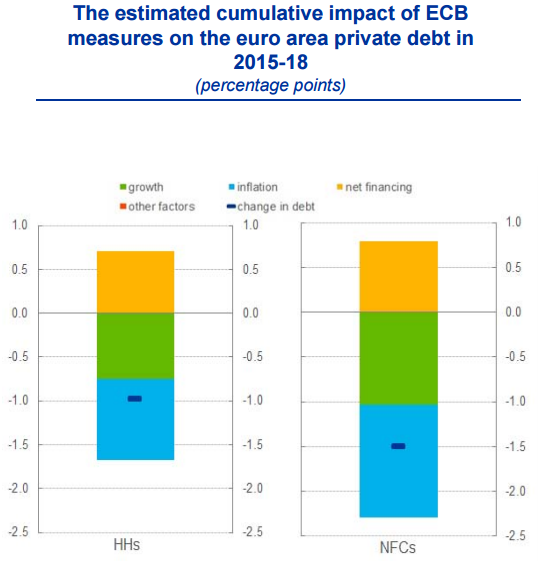 For details on the ECB economists’ argument, see Massimo Rostagno and his co-authors’ full presentation.